A great way to get into the holiday spirit and to inspire a new coin collector (or an old one) is to give the gift of money—not a drab check or a soulless gift card, but a collectible coin! And you can do this on almost any budget. The handful of gifts I’m going to suggest here range in price from under $30 to about $1,000. 2018 Proof Set of US coinage ($27.95). It seems like there are almost limitless offerings of current-year coins offered by the Mint. The most basic but also the most visually awe-inspiring is the current-year Proof Set of US coinage. A proof coin is a sight to behold: It has a spectacular cameo contrast between its frosted devices (the images such as portrait, plus date and lettering) and intensely reflective mirror-like field (the background). Proof coins undergo a special manufacturing process to create this stunning appearance and are sold to collectors at a price above the face value of the coin—well worth it as a timely gift. The 2018 Proof Set is priced at $27.95 and is available on the Mint’s website. It includes 10 coins: penny, nickel, dime, half-dollar, dollar coin and five different quarters from the America the Beautiful Quarters Program. As with all Mint products, the values of these sets fluctuate with market conditions after release. Some recently-issued sets of coins from the Mint don’t have a lot of collector interest, and they are available in the aftermarket from coin dealers for less than the original Mint issue prices. The values of these sets, and collectible coins in general, is determined by supply and demand. Uncut sheet of 10 one-dollar bills ($27). Although US banknotes are printed by the US Bureau of Engraving and Printing (BEP), the Mint is the official vendor of BEP products and souvenirs. One of the most novel products of the BEP is the uncut US currency sheet, available in denominations of $1 through $100. These sheets can be given in the original packaging or framed. A sheet of 10 one-dollar notes, my holiday gift favorite, is priced at $27.00, a 20-note sheet at $43 and a spectacular 50-note sheet at $86. If you want to go wild, this series tops out with a very impressive sheet of 16 uncut $100 bills that sells for $1,800. Although the bills making up uncut sheets have a total face value of less than the price of the sheets, you are paying a premium for the packaging and novelty. By the way, although it’s perfect legal to cut these sheets apart and spend the bills, I would use caution about doing that in public. I knew someone who was showing off with his uncut sheet: He cut the bills in public to buy a drink and was mistaken for being a counterfeiter! COINage magazine, of which I am executive editor, has an article by coin expert Mike Fuljenz in its December 2018 issue suggesting that these sheets of uncut bills be used to wrap small holiday gifts. 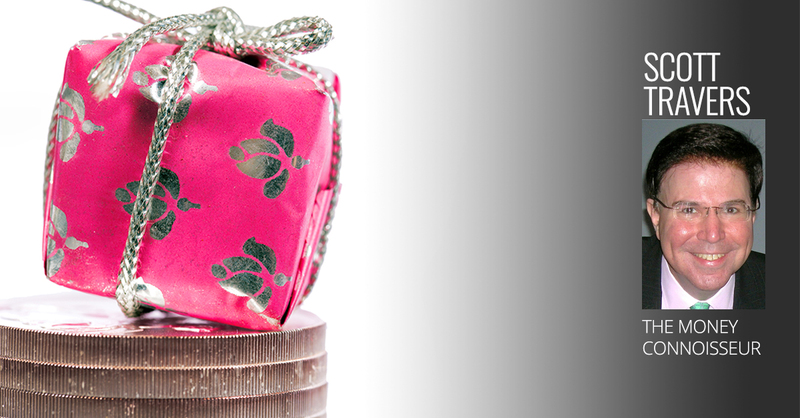 A gift wrapped in money would certainly get anyone’s attention! Membership in the national coin club ($28 annually). Perhaps the best present this holiday season is the gift of knowledge and belonging in the American Numismatic Association, the world’s largest non-profit organization of coin collectors. As I wrote in an earlier post, annual ANA membership normally starts at $28 per year (less for youngsters), but readers of my blog, The Money Connoisseur, can receive $10 off their first year’s dues by entering discount code ST2 (valid through 12/31/2019) in the online shopping cart. Benefits include a monthly magazine, free convention admission and an annual summer seminar. Morgan Silver Dollar, Uncirculated, PCGS- or NGC-certified as Mint State-63 ($65). If it works for your budget, this is my Number One value-priced coin gift recommendation for this or any other holiday season. Morgan silver dollars, minted from 1878 through 1904 and then again in 1921, are large coins that contain 0.7734 troy ounce of silver. So at its recent price of $14 per ounce, the value of a Morgan dollar’s silver is $10.83. But these are coins collected and valued by date. A “common” date Morgan dollar, such as an 1881 from the San Francisco Mint, graded Mint State-63 on the 1-to-70 scale can be purchased for about $65. As I explained in earlier posts, one is the lowest grade and 70 is perfect; 60 through 70 are the Mint State grades. Rare-date Morgan dollars can cost hundreds of thousands of dollars. My advice, even at the under-$100 levels, is to purchase coins that are certified as to their authenticity and grade by the Professional Coin Grading Service (PCGS) or the Numismatic Guaranty Corporation of America (NGC). PCGS and NGC have online authorized dealer directories that will help you locate a dealer near you. 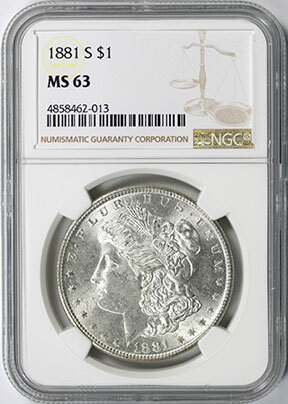 The 1881 Morgan dollar shown here, manufactured at the San Francisco Mint, is certified by NGC as MS-63 and encapsulated in a tamper-evident holder. This impressive presentation makes for a treasured memento and holiday gift that can inspire a non-collector to pursue numismatics (the study of coins, paper money and medallic art) as a lifetime hobby. Platinum, along with palladium, rhodium, iridium, ruthenium, and osmium, make up the platinum-group metals (PGMs). PGMs are seeing increasing industrial demand as more nations are tightening vehicle emissions controls, and PGMs are required in catalytic converters. China’s new national policy for emissions standards will give a significant boost to platinum. Even the US Mint, which produced its first legal-tender platinum coin in 1997, is jumping on the PGM bandwagon—in 2017, it introduced America’s first palladium coin. The Mint’s current platinum offering during this holiday season is the Preamble to the Declaration of Independence 2018 Platinum Proof Coin – Life. It contains exactly one ounce of platinum, which is worth about $840 as I write this in November 2018. I do not recommend this coin at its $1,270 Mint offering price because that price is about $430, or 50%, above the melt value of the metal it contains—and there are other attractive platinum coins priced much closer to the melt value of their metal, and these are better values. For example, the Canadian Maple Leaf one-ounce platinum coin carries a premium of only about $65 (8%) above the melt value of its metal. If you want to gift a US platinum coin, though, consider the US one-ounce platinum American Eagle—its premium is around $100 or so (12%) above the melt value, resulting in a cost of around $940 currently. These coins are available from coin dealers. The American Numismatic Association (ANA) has a coin dealer directory, and the Professional Numismatists Guild (PNG) has a bullion dealer directory.